Based on the fact that I love chicken, vegetables and pie, one would assume that chicken pot pie would be on the top of my list of “things I like to eat.” Well, up until a few years ago, that was absolutely wrong. I actually couldn’t stand the soggy crust. But I think it must have just been the pot pie I tried, because I’ve had some great pies since then. 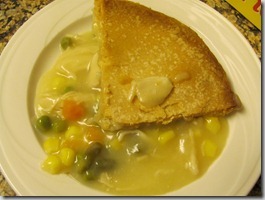 About a month ago, I commented on my friend Michelle’s blog when she posted about her dinner of Willow Tree chicken pot pie. Lo and behold, a few days later I received an e-mail asking if I wanted a coupon to try their pies! “Absolutely!” I replied. Willow Tree is a local Massachusetts company that started in the late 19th, early 20th century. They started as the main poultry and egg distributer in the Attleboro area, until they were advised to go into the chicken pot pie business. There popularity grew almost over night. They have a main store in Attleboro and Willow Tree pies are sold at several local grocery stores. Mine was purchased at Shaws. I was given a complimentary coupon to try the Willow Tree pie, and in return, to give my honest review on the product. During the 1 hour and 15 minutes that it took to cook, the kitchen smelled great. I couldn’t wait to dig in. The crust was crumbly and flaky, and I loved that it didn’t get soggy at all. The crust was only on top though and the bottom of the dish was all chicken and vegetables. There were huge chunks of chicken, but a little bit more vegetables would have been great. They did taste fresh though and not at all soggy. It was a tad salty for my liking though, but the flavor was delicious. Next time, I would probably take the advice of putting a smear of butter on the crust since the flavor was a bit lacking. David and I easily finished off the pie, which he agreed was flavorful as well. Probably the only major downside of the dish was that David found a chicken bone in his slice. Woops! And based on the varieties that they offer, I would love to try the pot pie with roasted potatoes. Thank you Willow Tree for allowing me the opportunity to try your product! !